Ummmm… is that a 2-5-3 formation??? Read on to find out more about our strategy this week! Manchester United have kept the highest number of cleansheets so far in the Premier League (7). David De Gea (5.5m) earns the gloves for this gameweek as the Baggies visit Old Trafford to break his streak of 4 consecutive clean sheets. FPL’s highest scoring goalkeeper Heurelho Gomes (4.6m) continued his form with two consecutive cleansheets and makes a great replacement for Boaz Myhill who has a tough lineup of fixtures. Arsenal’s lightning bolt Hector Bellerin did not travel to the Allianz Arena for their 5-1 defeat against Bayern Munich owing to a groin injury and is expected to miss the home game against Spurs as well. We wouldn’t suggest replacing him as the injury isn’t serious and the Spanish right-back should be back in action after next week’s International break. This puts us in a tough spot though as benching Bellerin makes our defense real weak. So for this week, we believe attack is the best form of defense! We’re playing our All-Out-Attack chip and bringing in a 5th midfielder to go all guns blazing with a 2-5-3 formation! Chris Smalling (6.5m) and Aleksandar Kolarov (6.2m) have stood the test of time and will be the only two players taking over the responsibility of our defense. Along with the 3 consecutive cleansheets in the Premier League, United also added another one against CSKA Moscow in their mid-week Champions League fixture and Smalling has been the strongest pillar in the Red Devils’ back-four. Smalling has slowly grown into a solid centre back and has shown exceptional consistency in his performances which has put him at the top of the defenders’ scoreboard in FPL. Kolarov retains his position in the squad as City goes to Villa Park to face the bottom of the table club who lost 2-0 in the same fixture last year. Alternatives: Marcos Rojo (5.4m) and Bacary Sagna (5.5m) are great budget alternatives to our Manchester duo. Kevin De Bryune (10.7m), Alexis Sanchez (11.6m) and Dimitri Payet (8.3m) retain their positions thanks to excellent form and lucrative fixtures. Riyad Mahrez (6.6m) made a comeback to our lineup with a brace against West Bromwich Albion. The Algerian attacking midfielder is FPL’s highest scorer with 7 goals and 5 assists. Leicester has scored in all games this season, in fact, Leicester games have seen the most goals in the premier league season so far! With an average of 3.2 shots and 2.3 key passes per game, you can expect Mahrez to bag you points one way or another against Watford. Gerard Deulofeu (6.2m) has been in impressive form with 1 goal and 3 assists in his last 2 games for Everton. This former Barcelona youngster showed some great skills as the Toffees thrashed Sunderland 6-2 last week. The Spaniard could be a great differential for your team as Sunderland faces West Ham who have failed to beat Everton in their last 17 meetings. Alternatives: Mesut Ozil (8.7m) is undoubtedly the midfielder in the best form right now having provided 7 assist and 1 goal for the Gunners in the last 5 matches. He even managed to score a goal with his arm against Bayern Munich mid-week which was later disallowed! Being almost 3m cheaper than Sanchez, Ozil makes a great alternative. 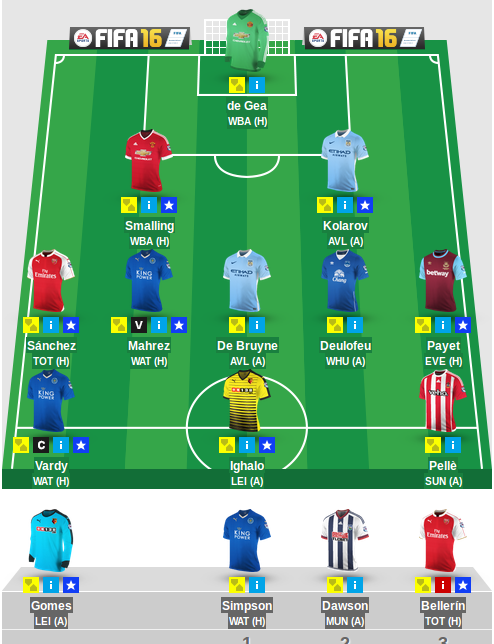 Picking 3 strikers is going to be tough this week as FPL managers will be spoilt for choice! We’ve retained the same strike force as last weekend owing to their form and our budget constraints! Jamie Vardy (6.9m), the top scoring player in the league right now, has been in exceptional form having scored in 8 consecutive matches for the Foxes and looks like he’s raring to beat Ruud Van Nistelrooy’s record of scoring in 10 consecutive matches. Graziano Pelle (8.5m) scored a goal last week and has an easy fixture away against Sunderland who were annihilated 8-0 at St Mary’s Stadium last season. Odion Ighalo (5.5m) is the best striker you can buy for under 6 million. The Nigerian has scored 2 goals and 2 assists in as many games which takes him to the 2nd highest scoring striker in FPL. Alternatives: Wilfried Bony (8.4m) scored a goal against Sevilla, Harry Kane (9.3m) scored 4 goals and 5 bonus points in the last two games, Christian Benteke (8.3m) scored 2 goals, 1 assist and 5 bonus points in the last 2 games, Romelu Lukaku (8.5m) scored 1 goal, 2 assists and 2 bonus points in his last match. Don’t you wish the All-Out-Attack chip let you pick more strikers?! This entry was posted in General, Squad. Bookmark the permalink.